Liar & Spy by Rebecca Stead. Review: Are you the type of person that likes hanging at the edge of your seat? Then, Liar & Spy by Rebecca Stead takes you to an apartment in Brooklyn and tells about a seventh-grade kid named Georges (Pronounced George. The -s is silent). To many people he is different and he also bets bullied. He then meets Safer while moving into his new apartment. Safer is a twelve-year-old who likes to drink coffee and does not go to school. Georges is a kid who is bullied by the so called popular kids. One of those so called popular friends used to be his best friend, but he doesn't bully Georges. Georges has to move from a house with a custom bed to an apartment with his father's old and boring bed. While entering the apartment lobby, Georges's father sees a sign that says ÒSpy Club TodayÓ which obviously told that the sign was old by the way the paper was crumbled up at the edges. His father wrote on the paper Òwhat timeÓ and later that day Georges walked by and noticed the sign said 1:30. So Georges went to the basement at 1:30 and that is when he meets Safer. So they start to train Georges to try to stop the Mysterious Mr. X who they believe is taking bodies in and killing those people. They also believe that he puts them into a large suitcase. So all of his training with Safer helps him in school with all the bully trouble he has. In the end everyone who gets bullied for being different, they all come together and form a group. This group makes all those people that are different, the new normal. Liar & Spy is a really good book, but in my opinion it does start off with a slow start. Do not let this confuse you. Even though it does start off on a slow start, it does have many dramatic moments that make it flow very smoothly. The whole book is was very suspenseful with many shocking moments. 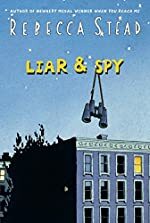 Liar & Spy would be great for kids 10 and up. Liar & Spy does include just about 3 or 4 bad words, but the words are very minor. It also includes a couple of confusing words that are in about one every two chapters. I give this book 4.5 out of 5 because of the tiny slow start, but do not let the slow start deter you. Liar & Spy is an excellent book that I would recommend to you. Review written by Luis (6th grade student). We would like to thank Random House for providing a copy of Liar & Spy for this review. Have you read Liar & Spy? How would you rate it?